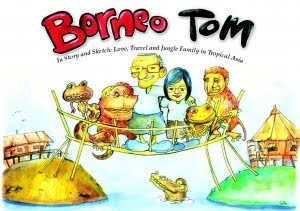 Borneo Tom - In Story and Sketch: Love, Travel and Jungle Family in Tropical Asia takes you on a quirky journey filled with many interesting adventures told in an essay style prose and offset with fitting and oftentimes, comical black and white caricature-like illustrations. Tom is diagnosed with a rare, incurable, neurological disease and decides to step out of his comfort zone, whip out his bucket list and do the things he has always dreamed of doing. He sets out for Malaysia, much to the consternation of his friends and family. With daughter, Christine, in tow, he assures everyone he would make frequent return visits to the United States for medical treatment. The two set out for the time of their lives and Borneo Tom is born. Along his travels he shares with us not only local customs, local history and landmarks, but personal thoughts and insights. We learn of Tom's strength and determination, like the Little Engine That Could, he continues to push ahead and keep moving forward in all that he does, even when the odds seemed against him. I enjoyed the read and found myself giggling over some of the silly things that Tom does or says, like standing over the equator, dancing a jig in hopes of becoming more virile, or when he bought a bowl Laksa Sarawak and after being assured by the shopkeeper that it wasn't hot, he soon finds out that is not the case as he swears his teeth melted. If I had any complaints, it would be that I wished some of his anecdotes were a little more descriptive, I wanted to stay longer in some areas of his book and less in others. I loved the historical aspect he shares from his viewpoint and would have loved to seen more included and I loved the surprise at the end of the book, who would have thought??!! Science Teacher Tom McLaughlin battled a rare neurological disease to a stand still, packed up his life and moved to Malaysian Borneo from a Washington D.C. suburb. Landing in Kuching, he quickly learned the Malay language and involved himself in projects which includes orangutan rehabilitation and research about the famed naturalist, Alfred Wallace, whose thunder was stolen by Charles Darwin.